Want to save even more at Horsford’s Valu Mart? Horsford’s has announced it is now offering E-Coupons . The Company has upgraded their pioneering Valu Club Card Programme with it’s new Valu Club PLUS. The upgraded Valu CLUB PLus Programme offers members an increased and widened plethora of benefits and incentives through the introduction of E-Coupons. The E or Electronic coupons can be “clipped” online, printed and redeemed at the store checkouts. Current Valu Club members can upgrade their membership and become Valu CLUB PLUS members by updating your card information with a valid Email address. This can be done by simply filling out a registration form which can be collected at any of the Valu Mart Locations. Valu Club Members who have already provided a VALID Email address in their initial sign up or registration should’ve already received an email welcoming them to the Valu PLUS Club and introducing the new E-Coupons. 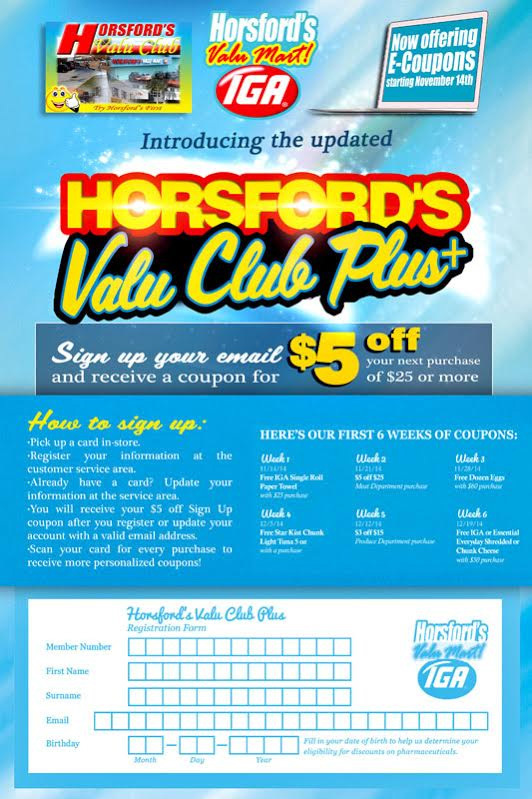 Those Valu PLUS Club members in addition to those who upgrade by signing up their email will receive a $5 e-coupon to apply toward their next purchase at Horsford’s Valu Mart of $25 or more. Valu PLUS members will not only receive a $5 coupon upon sign up or card upgrade but they will also receive weekly coupons, discounts and other benefits through the E-Coupons programme. The first six weeks of coupons beginning on Novemeber 14th will include e-coupons for a dozen free eggs with any purchase of $60 or more in week 3. As well as a free can of tuna with every purchase in week 4. Plus many other similar weekly e-coupon offers. “We are proud to introduce E-Coupons to our Valu Club members. Just as we were pioneers in the frequent buyer club programme in the federation we are again leading the way in offering benefits and incentives including discount coupons,” said Wallis Willkin, Marketing Manager at Horsford’s.